Microsoft Corporation, (NASDAQ: MSFT, HKEX: 4338) is a multinational computer technology corporation that develops, manufactures, licenses, and supports a wide range of software products for computing devices. Founded by Bill Gates and Paul Allen, and headquartered in Redmond, Washington, USA, its best-selling products are the Microsoft Windows operating system (OS) and Microsoft Office suite of productivity software. Originally founded to develop and sell BASIC interpreters for the Altair 8800, Microsoft rose to dominate the home computer operating system market with MS-DOS in the mid-1980s, followed by its Windows operating systems. Its main products, including the free Internet Explorer, have achieved near-ubiquity in the desktop computer market. Microsoft possesses footholds in other markets, with assets such as the MSNBC cable television network and the MSN Internet portal. The company also markets computer hardware products such as mice and keyboards, and home entertainment products such as the Xbox. In 1986, the company released an initial public offering (IPO) in the stock market, which, due to the ensuing rise of the stock price, has made four billionaires and an estimated 12,000 millionaires from Microsoft employees. Throughout its history the company has been the target of criticism for monopolistic and anti-competitive business practices including locking in customers and making it difficult for other companies to sell their software. The U.S. Justice Department and the European Commission, have both ruled against Microsoft for various antitrust violations. Microsoft was founded on April 4, 1975 in Albuquerque, New Mexico, by William Henry Gates III, (better known as Bill Gates, b. 1955) and Paul Allen (1953-2018). The two had been friends in high school, where they shared a common interest in computer programming. Gates was a student at Harvard and Allen was working as a programmer for Honeywell when they read in the January 1, 1975 issue of Popular Electronics about the Altair 8800, a microcomputer sold as a mail-order kit by Micro Instrumentation and Telemetry Systems (MITS). Gates called MITS, offering to demonstrate an implementation of the BASIC programming language for the system. In the eight weeks before the demonstration was scheduled, Gates and Allen quickly developed an adaptation of BASIC for the Altair. When the demonstration was successful, MITS agreed to distribute Altair BASIC. Gates left Harvard University, moved to Albuquerque, New Mexico where MITS was located, and founded Microsoft there. On January 1, 1979, the company moved from Albuquerque to a new home in Bellevue, Washington. Steve Ballmer (b. 1956) joined the company on June 11, 1980, and later succeeded Bill Gates as CEO. The company was incorporated in the state of Washington on June 25, 1981, under the name "Microsoft, Inc." Bill Gates became President of the company and Chairman of the Board, and Paul Allen became Executive Vice President. DOS (Disk Operating System) was the operating system that brought the company its first real success. On August 12, 1981, after negotiations with Digital Research failed, IBM awarded a contract to Microsoft to provide a version of the CP/M operating system for use in its new IBM Personal Computer (PC). Microsoft purchased a CP/M clone OS called 86-DOS (originally known as QDOS for "Quick and Dirty Operating System") from Seattle Computer Products, which IBM renamed to PC-DOS. Around 1983, Microsoft collaborated with several companies to create a home computer system, MSX, which contained its own version of the DOS operating system, entitled MSX-DOS; this became relatively popular in Japan, Europe and South America. After Columbia Data Products successfully cloned the IBM BIOS, quickly followed by Eagle Computer and Compaq, PCs manufactured by other companies flooded the market. Its arrangement with IBM allowed Microsoft to have control of its own QDOS derivative, MS-DOS, and through aggressive marketing of the operating system to other manufacturers of PCs, Microsoft became one of the major software vendors in the home computer industry. Microsoft continued to expand its product line in other markets with the release of the Microsoft Mouse on May 2, 1983. Microsoft Press, a book publishing division, debuted on July 11 the same year with two titles: Exploring the IBM PCjr Home Computer, by Peter Norton; and "The Apple Macintosh Book, by Cary Lu. In August 1985, Microsoft and IBM partnered in the development of a different operating system called OS/2. On November 20, 1985, Microsoft released its first retail version of Microsoft Windows, originally a graphical layer on top of its MS-DOS operating system. In 1987, Microsoft released its first version of OS/2 to original equipment manufacturers (OEMs). In 1989, Microsoft introduced its flagship office software suite, Microsoft Office, a bundle of separate office productivity applications, such as Microsoft Word and Microsoft Excel. On May 22, 1990 Microsoft launched Windows 3.0, a new version of its operating system boasting features such as streamlined user interface graphics and improved protected mode capability for the Intel 386 processor; it sold over 100,000 copies in two weeks. Windows generated more revenue for Microsoft than OS/2, and the company decided to move more resources from OS/2 to Windows. In the ensuing years, the popularity of OS/2 declined, and Windows quickly became the favored PC platform. During the transition from MS-DOS to Windows, the success of Microsoft Office allowed the company to outpace its competitors in applications software, such as WordPerfect and Lotus 1-2-3. Eventually, Microsoft Office became the dominant business suite, with a market share far exceeding that of its competitors. In 1993, Microsoft released Windows NT 3.1, a business operating system with the Windows 3.1 user interface but an entirely different kernel. In 1995, Microsoft released Windows 95, a new version of the company's flagship operating system which featured a completely new user interface, including a novel start button; more than a million copies of Microsoft Windows 95 were sold in the first four days after its release. The company also released its web browser, Internet Explorer, with the Windows 95 Plus! Pack in August 1995 and subsequent Windows versions. On, May 26, 1995, Bill Gates issued an internal "Internet Tidal Wave memo"for Microsoft employees, evaluating the potential of the Internet and outlining a strategy for Microsoft to expand its product line into computer networking and the World Wide Web. On August 24, 1995, it launched a major online service, MSN (Microsoft Network), as a direct competitor to AOL. MSN became an umbrella service for Microsoft's online services. The company continued to branch out into new markets in 1996, starting with a joint venture with NBC to create a new 24/7 cable news station, MSNBC. Microsoft entered the personal digital assistant (PDA) market in November 1996 with Windows CE 1.0, a new version of their flagship operating system, specifically designed to run on low-memory, low-performance machines, such as handhelds and other small computers. Later in 1997, Internet Explorer 4.0 was released for both Mac OS and Windows, marking the beginning of the takeover of the browser market from rival Netscape. In October, the Justice Department filed a motion in the Federal District Court in which they stated that Microsoft had violated an agreement signed in 1994, and asked the court to stop the bundling of Internet Explorer with Windows. In 1998 Bill Gates appointed Steve Ballmer president of Microsoft but remained as Chair and CEO. The company released Windows 98, an update to Windows 95 that incorporated a number of Internet-focused features and support for new types of devices. 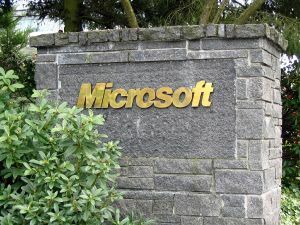 On April 3, 2000, a judgment was handed down in the case of United States v. Microsoft, calling the company an "abusive monopoly" and forcing the company to split into two separate units. Part of this ruling was later overturned by a federal appeals court, and eventually a settlement was made with the U.S. Department of Justice in 2001. In 2001, Microsoft released Windows XP, encompassing the features of both its business and home product lines. Before XP was released, Microsoft had to maintain both the NT and the 9x codebase. XP introduced a new graphical user interface, the first such change since Windows 95. In late 2001, with the release of the Xbox, Microsoft entered the multi-billion-dollar game console market dominated by Sony and Nintendo. In March 2004, antitrust legal action was brought against Microsoft by the European Union for abusing its dominance with the Windows operating system (see European Union Microsoft antitrust case), eventually resulting in a judgment to produce new versions of its Windows XP platform—called "Windows XP Home Edition N" and "Windows XP Professional N"—that did not include its Windows Media Player, as well as a record fine of €497 million ($613 million). On June 27, 2008, Bill Gates retired from day-to day activities at Microsoft to focus on philanthropy with his Bill & Melinda Gates Foundation, following a two year transition from his role as Chief Software Architect, which was taken by Ray Ozzie, but remained the company's Chairman, head of the Board of Directors and adviser on key projects. Windows Vista, released in January 2007, sold 140 million copies by August 2008. Microsoft Office 2007, released at the same time, features a "Ribbon" user interface which is a significant departure from its predecessors. Relatively strong sales of both titles helped to produce a record profit in 2007. As the smartphone industry boomed, Microsoft struggled to keep up with its rivals Apple and Google in providing a modern smartphone operating system. As a result, in 2010, Microsoft revamped their aging flagship mobile operating system, Windows Mobile, replacing it with the new Windows Phone OS; along with a new strategy in the smartphone industry that has Microsoft working more closely with smartphone manufacturers, such as Nokia, and to provide a consistent user experience across all smartphones using Microsoft's Windows Phone OS. It used a new user interface design language, codenamed "Metro", which prominently used simple shapes, typography and iconography, and the concept of minimalism. On June 18, 2012, Microsoft unveiled the Surface, the first computer in the company's history to have its hardware made by Microsoft. On July 31, 2012, Microsoft launched the Outlook.com webmail service to compete with Gmail. In July 2012, Microsoft sold its 50 per cent stake in MSNBC.com, which it had run as a joint venture with NBC since 1996. On October 1, Microsoft announced its intention to launch a news operation, part of a new-look MSN, at the time of the Windows 8 launch that was later in the month. On October 26, 2012, Microsoft launched Windows 8 and the Microsoft Surface. Three days later, Windows Phone 8 was launched. To cope with the potential for an increase in demand for products and services, Microsoft opened a number of "holiday stores" across the U.S. to complement the increasing number of "bricks-and-mortar" Microsoft Stores that opened in 2012. The Kinect, the motion sensing input devices by Microsoft, which was first introduced in November 2010 was upgraded for the 2013 release of the eighth-generation Xbox One. Its capabilities were revealed in May 2013. The new Kinect uses an ultra-wide 1080p camera, it can function in the dark due to an infrared sensor, it employs higher-end processing power and new software, it can distinguish between fine movements (such as a thumb movements), and the device can determine a user's heart rate by looking at his/her face. Microsoft filed a patent application in 2011 that suggests that the corporation may use the Kinect camera system to monitor the behavior of television viewers as part of a plan to make the viewing experience more active. On September 3, 2013, Microsoft agreed to buy Nokia's mobile unit for $7 billion. The Alliance for Affordable Internet (A4AI) was launched in October 2013 and Microsoft is part of the coalition of public and private organizations that also includes Facebook, Intel and Google. Led by Tim Berners-Lee, the A4AI seeks to make Internet access more affordable so that access is broadened in the developing world, where only 31% of people are online. Google will help to decrease internet access prices so that they fall below the UN Broadband Commission's worldwide target of 5 per cent of monthly income. In line with the maturing PC business, in July 2013, Microsoft announced that it would reorganize the business into four new business divisions by function: Operating System, Apps, Cloud and Devices. All previous divisions were to be diluted into new divisions without any workforce cut. To increase precision in tracking the performance of each unit and delegating responsibility, Microsoft reorganized into seven core business groups—each an independent financial entity—in April 2002. In September 2005, Microsoft announced a rationalization of its original seven business groups into the three core divisions that exist today: the Windows Client, MSN and Server and Tool groups were merged into the Microsoft Platform Products and Services Division; the Information Worker and Microsoft Business Solutions groups were merged into the Microsoft Business Division; and the Mobile and Embedded Devices and Home and Entertainment groups were merged into the Microsoft Entertainment and Devices Division. The Platform Products and Services Division produces Microsoft's flagship product, the Windows operating system. It has been produced in many versions, including Windows 3.1, Windows 95, Windows 98, Windows 2000, Windows Me, Windows Server 2003, Windows XP and Windows Vista, Windows 7, Windows 8, and Windows 10. Almost all IBM compatible personal computers come with Windows pre-installed. The current desktop version of Windows is Windows Vista (Windows 6.0). The online service MSN, the cable television channel MSNBC and MSNBC.com web site (both co-owned with NBC Universal) also are under this division. At the end of 1997, Microsoft acquired Hotmail, the most popular webmail service, which it rebranded as "MSN Hotmail." In 1999, Microsoft introduced MSN Messenger, an instant messaging client, to compete with the popular AOL Instant Messenger. Along with Windows Vista, MSN Messenger became Windows Live Messenger. Microsoft Visual Studio is the company's set of programming tools and compilers. The software product is GUI-oriented and links easily with the Windows APIs, but must be specially configured if used with non-Microsoft libraries. The current version is Visual Studio 2008. The previous version, Visual Studio 2005 was a major improvement over its predecessor, Visual Studio.Net 2003, named after the .NET initiative, a Microsoft marketing initiative covering a number of technologies. Microsoft's definition of .NET continues to evolve. As of 2004, .NET aims to ease the development of Microsoft Windows-based applications that use the Internet, by deploying a new Microsoft communications system, Indigo (now renamed Windows Communication Foundation). This is intended to address some issues previously introduced by Microsoft's DLL design, which made it difficult, even impossible in some situations, to manage, install multiple versions of complex software packages on the same system (see DLL-hell), and provide a more consistent development platform for all Windows applications (see Common Language Infrastructure). In addition, Microsoft established a set of certification programs to recognize individuals who have expertise in its software and solutions. Similar to offerings from Cisco, Sun Microsystems, Novell, IBM, and Oracle Corporation, these tests are designed to identify a minimal set of proficiencies in a specific role; this includes developers ("Microsoft Certified Solution Developer"), system/network analysts ("Microsoft Certified Systems Engineer"), trainers ("Microsoft Certified Trainers") and administrators ("Microsoft Certified Systems Administrator" and "Microsoft Certified Database Administrator"). The Microsoft Business Division produces Microsoft Office, the company's line of office software. The software product includes Word (a word processor), Access (a personal relational database application), Excel (a spreadsheet program), Outlook (Windows-only groupware, frequently used with Exchange Server), PowerPoint (presentation software), and Publisher (desktop publishing software). A number of other products were added later with the release of Office 2003 including Visio, Project, MapPoint, InfoPath and OneNote. The division focuses on developing financial and business management software for companies. These products include products formerly produced by the Business Solutions Group, which was created in April 2001 with the acquisition of Great Plains. Subsequently, Navision was acquired to provide a similar entry into the European market. Axapta and Solomon, catering to similar markets, were combined with the Navision and Great Plains lines into a common platform called Microsoft Dynamics. Microsoft has attempted to expand the Windows brand into many other markets, with products such as Windows CE for PDAs and its "Windows-powered" Smartphone products. Microsoft initially entered the mobile market through Windows CE for handheld devices, which today has developed into Windows Mobile 6. The focus of the operating system is devices where the OS may not directly be visible to the end user, in particular, appliances and cars. Microsoft sells computer games that run on Windows PCs, including titles such as Age of Empires, Halo and the Microsoft Flight Simulator series. Microsoft Zone hosts free premium and retail games where players can compete against each other and in tournaments. Microsoft entered the multi-billion-dollar game console market dominated by Sony and Nintendo in late 2001 with the release of the Xbox. The company develops and publishes its own video games for this console, with the help of its Microsoft Game Studios subsidiary, in addition to third-party Xbox video game publishers such as Electronic Arts and Activision, who pay a license fee to publish games for the system. 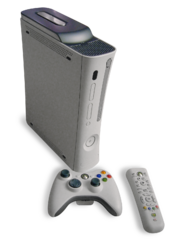 The Xbox successor, Xbox 360, was released on September 22, 2005 in North America and other countries. In addition to the Xbox line of products, Microsoft also markets a number of other computing-related hardware products, including mice, keyboards, joysticks, and gamepads, along with other game controllers, the production of which is outsourced in most cases. One of Bill Gates' key visions for the company was to "to get a workstation running our software onto every desk and eventually in every home." Microsoft holds a large market share of home and business operating systems, and plays an important role in the economics of software. Microsoft has footholds in other markets besides operating systems and office suites, with assets such as the MSNBC cable channel, the MSN Internet portal, and the Microsoft Encarta multimedia encyclopedia. The company also markets both computer hardware products such as the Microsoft mouse and home entertainment products such as the Xbox, Xbox 360, and MSN TV. Technical references for developers and articles for various Microsoft magazines such as Microsoft Systems Journal (or MSJ) are available through the Microsoft Developer Network, often called MSDN. MSDN also offers subscriptions for companies and individuals, and the more expensive subscriptions usually offer access to pre-release or beta versions of Microsoft software. In recent years, Microsoft has launched a community site for developers and users, entitled Channel 9, which provides many modern features such as a wiki and an Internet forum. Most free technical support available through Microsoft is provided through online Usenet newsgroups (in the early days it was also provided on CompuServe). There are several of these newsgroups for nearly every product Microsoft provides, and often they are monitored by Microsoft employees. People who are helpful on the newsgroups can be elected by other peers or Microsoft employees for Microsoft Most Valuable Professional (MVP) status, which entitles people to a special social status, in addition to possibilities for awards and other benefits. In 1987, Microsoft adopted its current logo, the so-called "Pac-Man Logo," designed by Scott Baker. According to the March 1987 Computer Reseller News Magazine, "The new logo, in Helvetica italic typeface, has a slash between the o and s to emphasize the "soft" part of the name and convey motion and speed." Microsoft's logo with the "Your potential. Our passion." tagline below the main corporate name, is based on the slogan Microsoft had as of 2008. The company started using the logo in the United States in 2002 and eventually featured it in a TV campaign, replacing the previous tagline of "Where do you want to go today?" Greenpeace's 2008 Greener Electronics guide ranked Microsoft the second worst company for the environment among makers of game consoles, behind only Nintendo. Microsoft's newest building on its campus in Hyderabad, India was built as an environmentally friendly structure. Experts at Microsoft Research India developed a project called Digital Green in 2008, to educate farmers in India on how to use azolla, an aquatic fern fed to cows to increase milk production. Microsoft has phased out the use of polyvinyl chloride plastic in its packaging material, due to environmental concerns. Polyvinyl chloride, also referred to as PVC or vinyl, can release toxins into the environment during production and if it is burned after production. These toxins are synthetic chemicals linked to cancer and problems with the reproductive and immune systems. In six months time, Microsoft eliminated approximately 361,000 pounds of polyvinyl packaging by transitioning to a packaging material utilizing polyethylene terephthalate plastic (PET). The company continues to research further eco-friendly packaging made of corn starch, sugar, and vegetable oil. Microsoft is using some renewable energy sources in its Silicon Valley campus, where the company has installed over 2000 solar panels spanning 30,000 square feet on top of its buildings. 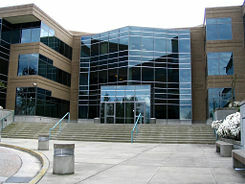 Beginning in June 2008, Microsoft added compost bins in all cafeterias on its Redmond campus, and replaced all polystyrene plates and cups and plastic flatware with biodegradable alternatives. In the first two months after this transition, the Redmond campus reduced its non-compost trash output by 50 percent. Microsoft has received considerable criticism for various aspects of its products and business practices. Critics often target issues with ease of use, stability, and security of the company's software. More recently, Trojan horses and other spyware and malware exploits have plagued numerous users due to flaws in the security of Microsoft Windows and other programs. Microsoft is accused of locking vendors and consumers into its products, and of not following and complying with existing standards in its software. After bundling the Internet Explorer web browser into its Windows operating system in the late 1990s (without requiring a separate purchase) and acquiring a dominant share in the web browser market, the antitrust case United States v. Microsoft was brought against the company. In a series of rulings by judge Thomas Penfield Jackson, the company was found to have violated its earlier consent decree and abused its monopoly in the desktop operating systems market. The "findings of fact" during the antitrust case established that Microsoft has a monopoly in the PC desktop operating systems market. Large computer vendors bundle Microsoft Windows with the majority of the personal computers they sell. The Findings of Fact in the United States Microsoft antitrust case established that "One of the ways Microsoft combats piracy is by advising OEMs that they will be charged a higher price for Windows unless they drastically limit the number of PCs that they sell without an operating system pre-installed. In 1998, all major OEMs agreed to this restriction." This has been called the "Windows tax" or "Microsoft tax". In 2003–2004, the European Commission investigated the bundling of Windows Media Player into Windows, a practice which rivals complained was destroying the market for their own products. The company was subsequently fined a record €497 million ($666 million) for its breaches of EU competition law. In December 2005, Microsoft was also fined $32 million in South Korea and was ordered to unbundle instant messaging, Windows Media Player and Windows Media Service, or let competitors' products take their place. Free software proponents point to the company's joining of the Trusted Computing Platform Alliance (TCPA) as a cause of concern. A group of companies that seek to implement an initiative called Trusted Computing, purportedly intended to increase security and privacy of a user's computer, the TCPA is decried by critics as a vehicle that will allow software developers to enforce restrictions on how their customers use the software they purchased. Advocates of free software also take issue with Microsoft's promotion of Digital Rights Management (DRM), a technology that allows content providers to impose restrictions on the methods by which their products are used on consumer hardware. Detractors contend that such technology may infringe on fair use and other rights, especially because it restricts legal activities such as re-mixing or reproduction of material for use in slide shows, or the resale of the goods by the customer. Microsoft has acquired several companies and products during its history, including some that competed with earlier Microsoft products. Its acquired assets include MS-DOS, Microsoft FrontPage, WebTV (now MSN TV), Hotmail, Direct3D, Internet Explorer, Microsoft Visio, and Windows Defender. Microsoft rebrands the primary products of the companies it acquires, and in many cases offers them for free or bundles them with its operating system. Microsoft contributes money to several think tanks, including the American Enterprise Institute, the Center for Strategic and International Studies, the Heritage Foundation, the Cato Institute and the Alexis de Tocqueville Institution. Critics allege that while giving the appearance of neutral third parties these organizations work to undermine Microsoft's competitors, for example stating "open-source software may offer [a] target for terrorists". Microsoft (along with Google, Yahoo, Cisco, AOL, Skype, and other companies) have cooperated with the Chinese government in implementing a system of Internet censorship. ↑ Brad Smith Microsoft. Retrieved September 18, 2018. ↑ 2.0 2.1 2.2 Earnings Release FY18 Q4 Microsoft, July 19, 2018. Retrieved September 18, 2018. ↑ 3.00 3.01 3.02 3.03 3.04 3.05 3.06 3.07 3.08 3.09 3.10 Timeline of Microsoft Corporation. ThoughtCo. Retrieved September 18, 2018. ↑ The History of Computing Project, Microsoft Company 15 September 1975 Retrieved September 18, 2018. ↑ Robert P. Merges, Peter S. Menell, and Mark A. Lemley, Intellectual Property in the New Technological Age (Aspen Law & Business, 2003, ISBN 073553652X). ↑ OS/2 PC Magazine, July 1987. Retrieved September 18, 2018. ↑ Looking back: Microsoft IPO, March 1986 Retrieved December 8, 2008. ↑ Wired.com, Wired 7.09: The World's First Trillionaire Retrieved December 8, 2008. ↑ Microsoft,com. Windows History (June 30, 2002) Retrieved December 8, 2008. ↑ David Both, A Short History of OS/2 Databook. Retrieved December 8, 2008. ↑ Harry McCracken, A Peek at Office Upgrade. PCWorld.com, (September 13, 2000) Retrieved December 8, 2008. ↑ Bill Gates, Microsoft, May 26, 1995. The Internet Tidal Wave Made publicly available at United States Department of Justice. United States v. Microsoft Trial Exhibits Retrieved December 8, 2008. ↑ The History of Microsoft Windows CE HPC:Factor.com. Retrieved December 8, 2008. ↑ U.S. Department of Justice United States v. Microsoft Retrieved December 8, 2008. ↑ 15.0 15.1 Thomas Penfield Jackson, U.S. District Judge U.S. Department of Justice, U.S. vs. Microsoft findings of fact (November 5, 1999) Retrieved December 8, 2008. ↑ Microsoft Windows XP Professional Features (August 25, 2004) Retrieved December 8, 2008. ↑ Bill & Melinda Gates Foundation Retrieved December 30, 2008. ↑ Jose Vilches, May 8, 2008, Gates: 140 million copies of Vista sold. TechSpot. Retrieved December 8, 2008. ↑ SEC Annual Report on Form 10-K Retrieved December 8, 2008. ↑ CNET News.com Microsoft's annual report: Open-source mental block The Open Road - The Business and Politics of Open Source by Matt Asay. Retrieved December 8, 2008. ↑ David Erickson, Open Networking Foundation News Release Openflow.org, March 21, 2011. Retrieved May 29, 2011. ↑ Katherine Noyes, "Google and other titans form Open Networking Foundation" Computerworld, March 23, 2011. Retrieved February 29, 2016. ↑ Microsoft releases final test version of Windows 8 Business Line, June 1, 2012. Retrieved February 29, 2016. ↑ Matt Rosoff, OK, So Windows 8 Is Coming To ARM Tablets...Someday (MSFT) San Francisco Chronicle, January 5, 2011. Retrieved February 29, 2016. ↑ Mark Sullivan, Microsoft Announces New 'Surface' Tablet PC PCWorld. Retrieved February 29, 2016. ↑ 26.0 26.1 Kurt Eichenwald, "Microsoft's Lost Decade: How Microsoft Lost Its Mojo", Vanity Fair, August 2012. Retrieved February 29, 2016. ↑ Paul Thurrott, Outlook.com Mail: Microsoft Reimagines Webmail Supersite for Windows, July 31, 2012. Retrieved February 29, 2016. ↑ Reuters, Comcast buys Microsoft stake in MSNBC.com July 16, 2012. Retrieved February 29, 2016. ↑ Bill Rigby, Microsoft launching news operation, new MSN Reuters, October 1, 2012. Retrieved February 29, 2016. ↑ Mary Jo Foley, Windows Phone 8 launch date revealed LiveSide.net, August 30, 2012. Retrieved February 29, 2016. ↑ Microsoft prepping for complete brand and product line relaunch, New York store coming the 26th wpcentral.com. Retrieved February 29, 2016. ↑ David Pierce, The all-seeing Kinect: tracking my face, arms, body, and heart on the Xbox OneThe Verge, May 21, 2013. Retrieved February 29, 2016. ↑ David Pierce, Microsoft buying Nokia's phone business in a $7.2 billion bid for its mobile future The Verge, September 2, 2013. Retrieved February 29, 2016. ↑ Samuel Gibbs, Sir Tim Berners-Lee and Google lead coalition for cheaper internet The Guardian, October 7, 2013. Retrieved February 29, 2016. ↑ Jason Ankeny, Microsoft's sweeping reorganization shifts focus to services, devices. July 11, 2013. Retrieved February 29, 2016. ↑ Microsoft CEO Steve Ballmer to retire within 12 months Microsoft News Center, August 23, 2013. Retrieved February 29, 2016. ↑ Microsoft.com. Our Commitment to Our Customers: Microsoft's Business (September 20, 2005) Retrieved December 8, 2008. ↑ 38.0 38.1 38.2 38.3 38.4 38.5 Microsoft Corporation Annual Report 2005 Microsoft.com. Retrieved December 8, 2008. ↑ Xbox 360 sells out within hours BBC News, (December 2, 2005) Retrieved December 8, 2008. ↑ Microsoft Systems Journal Homepage Microsoft.com. Retrieved December 8, 2008. ↑ Jeremy Reimer, Microsoft set to launch new marketing campaign Ars Technica, January 23, 2006. Retrieved December 8, 2008. ↑ Company scores plummet in Greener Electronics Guide greenpeace.org, June 25, 2008. Retrieved December 8, 2008. ↑ 43.0 43.1 Elinor Mills, Microsoft vs. Google: Who's greener? CNET News.com, June 6, 2006. Retrieved December 8, 2008. ↑ The Greening of Corporate America: #3Microsoft Environmental Stewardship greencorporateamerica.com, December 23, 2006. Retrieved December 8, 2008. ↑ Dawn Kawamoto, Microsoft to phase out toxic plastics CNET News.com, December 7, 2005. Retrieved December 8, 2008. ↑ Microsoft Solar Solar Times. Retrieved December 8, 2008. ↑ Andrew Orlowski, Writing history with Microsoft's Office lock-in. The Register (UK), April 25, 2003. Retrieved December 9, 2008. ↑ Andrew Orlowski, Eolas' web patent nullified The Register (UK), March 5, 2004. Retrieved December 8, 2008. ↑ U.S. Department of Justice U.S. v. Microsoft: Court's Findings of Fact Retrieved December 8, 2008. ↑ Jeremy Reimer, Dell goes Ubuntu; "Windows tax" is $50 according to pricing ARSTechnica, May 25, 2007. Retrieved December 8, 2008. ↑ South Korea fines Microsoft $32m BBC News, December 7, 2005. Retrieved December 8, 2008. ↑ Richard Stallman, Can You Trust Your Computer? GNU Project. Retrieved December 8, 2008. ↑ David Chisnall, DRM: Digital Rights or Digital Restrictions? Informit.com, May 4, 2006. Retrieved December 8, 2008. ↑ Microsoft's All-Out Counterattack BusinessWeek, May 15, 2000. Retrieved December 8, 2008. ↑ Microsoft's Linux ad 'misleading' BBC News, August 26, 2004. Retrieved December 8, 2008. The ASA's complaint was that "the measurements for Linux were performed on an IBM zSeries [mainframe], which was more expensive and did not perform as well as other IBM series." The comparison was to Windows Server 2003 running on two 900MHz Intel Xeon CPUs. ↑ Corporate Complicity in Chinese Internet Censorship Human Rights Watch, August 9, 2006. Retrieved December 8, 2008. Andrews, Paul. How the Web was won: Microsoft from Windows to the Web the inside story of how Bill Gates and his band of Internet idealists transformed a software empire. New York: Broadway Books. 1999. ISBN 9780767900485. Chapman, Merrill R. In search of stupidity: over 20 years of high-tech marketing disasters. Berkeley, CA: Apress. 2003. ISBN 1590597214. Cringely, Robert X. Accidental Empires: How the Boys of Silicon Valley Make Their Millions, Battle Foreign Competition, and Still Can't Get a Date. New York: Collins Business. 1996. ISBN 978-0887308550. Cusumano, Michael A., and Richard W. Selby. 1995. Microsoft secrets: how the world's most powerful software company creates technology, shapes markets, and manages people. New York: Free Press, 1995. ISBN 9780028740485. Edstrom, Jennifer, and Marlin Eller. Barbarians led by Bill Gates: Microsoft from the inside, how the world's richest corporation wields its power. New York: H. Holt, 1998. ISBN 0805057544. Manes, Stephen, and Paul Andrews. Gates: how Microsoft's mogul reinvented an industry—and made himself the richest man in America. New York: Doubleday, 1993. ISBN 9780385420754. Merges, Robert P., Peter S. Menell, and Mark A. Lemley. Intellectual Property in the New Technological Age. Aspen Law & Business, 2003. ISBN 073553652X. Mossberg, Walt, and Kara Swisher. Transcript: Bill Gates and Steve Jobs at D5 Wall Street Journal Digital Network. May 30, 2007. Quittner, Joshua, and Michelle Slatalla. Speeding the Net: the inside story of Netscape and how it challenged Microsoft. New York: Atlantic Monthly Press, 1998. ISBN 9780871137098. Stross, Randall E. The Microsoft way: the real story of how the company outsmarts its competition. Reading, MA: Addison-Wesley Pub. Co., 1996. ISBN 9780201409499. Wallace, James, and Jim Erickson. Hard drive: Bill Gates and the making of the Microsoft empire. New York: Wiley, 1992. ISBN 9780471568865. This page was last modified on 16 October 2018, at 22:10.